Win this app May 8th, 2016! 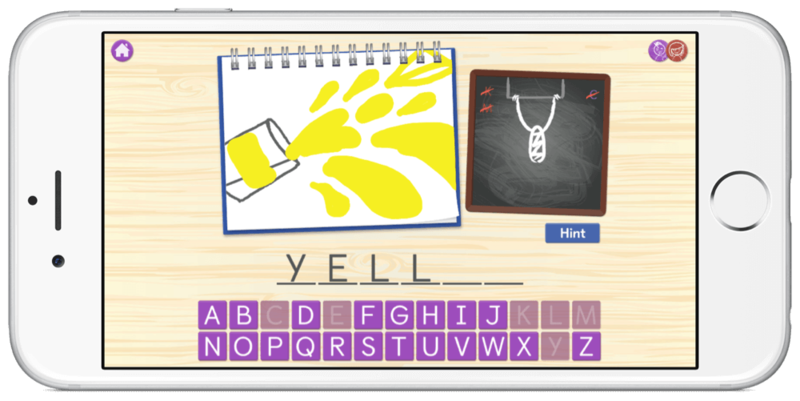 This clever app takes on the classic game of Hangman and encourages storytelling, sight words, and handwriting. It is jam packed with fun educational activities that promote creativity and frankly, a lot of fun. 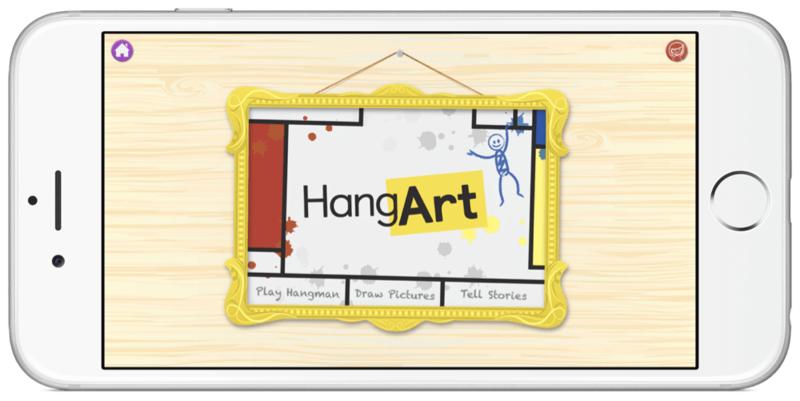 HangArt was built for children between the ages of 4-9 years of age. It has great incentives for children and will support those that struggle with learning disabilities, attention deficits, and fine motor skills. This app is very safe. There are no in-app purchases or pop up advertisements. The outside links are guarded with parent controls. HangArt was created by Literary Safari. It is a team built of writers, creative directors, educators, and more that are promoting literacy through children’s apps. When you open the app, you will need to set up an account. It is very easy to do. They ask for your name and grade level. That’s it! You can set up multiple profiles if you have more than one child. It packs a pretty big punch. There is a lot to do but it can be a little daunting to know how it all works together. Children with various disabilities can become overwhelmed at the thought of getting started or understanding multiple steps and directions. If it seems too complicated, they sometimes won’t be motivated to start. I would recommend a parent or teacher setting up the account for the child at first and introducing the app. I would also recommend parents reading through the user guide. After the child has navigated through the app and used the various activities, they will be good to continue on their own. The first activity is Hangman. This is played just like the classic version with pen and paper however they have placed the hangman character on a trapeze bar to make it more appropriate for children. As he gets out after guessing through the game, he will simply fall off the trapeze bar. You can play it with one or two people. If you play it with two people, each person will need their own account. The words chosen are routine K-3 sight words. You will take turns picking letters and trying to solve the word puzzle. One huge benefit to this app is the opportunity for visual learning. So many kids with special needs really thrive on visual aides and pictures. The images connected to the words are a huge help! After the word puzzle is solved, you will be asked to trace the word and practice handwriting. HangArt uses a font called Castledown which is dyslexic friendly and easier to learn from. When you have solved a word, a pop up will show with different emojis. You are supposed to grade how hard or easy the word has been. This tool can help make sure that parents and teachers understand which words require more practice. It also can be a self evaluation tool for the user to promote growth and understanding. I loved this idea however I would rather see a tracking tool or an option to turn that tool on/off. The pop up each time can be distracting and may disturb concentration for some. The second activity is the word gallery. As children have solved their words in the HangArt game, those words and illustrations will become viewable in the word gallery. You will see all of the already solved words. The illustrations are really fun and colorful. In addition, kids can draw their own word illustrations to be added. This is a really innovative idea that my 4 and 6 year old boys loved. The last activity is the Story Studio. This is my favorite. It brings everything together because with the same words from the HangArt game, you can use your word gallery to tell a story. 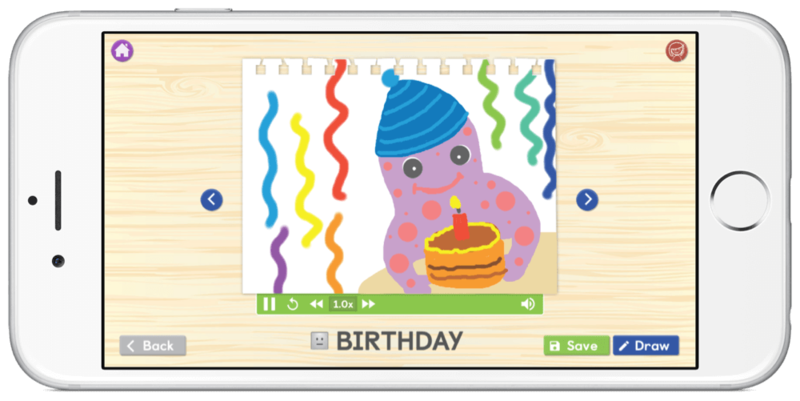 To create one, simply sequence the words and pictures where you want and record your own voice. It is so cool! You can see the story playback for you. It is important to note that you can do any of these activities out of order at any time. This app does offer a lot of free play activities and so you are not required to stick in order with all three activities. One thing I would love to see is a way to export and share these stories after they are complete. In conclusion, I would definitely recommend this app to children between the ages of 5 and 8 years old. It was really fun to play myself so it would be fun to see an adult version someday as well. This is a great tool for children being introduced to sight words. I loved the creative features. Even though there is a lot to do within the app, all of the activities come together nicely and give the child a goal to focus on. They will receive badges as they create stories and master words. I always recommend a one page user guide for apps with a lot of skills and activities available. The longer trouble shoot guides don’t get people started as well. 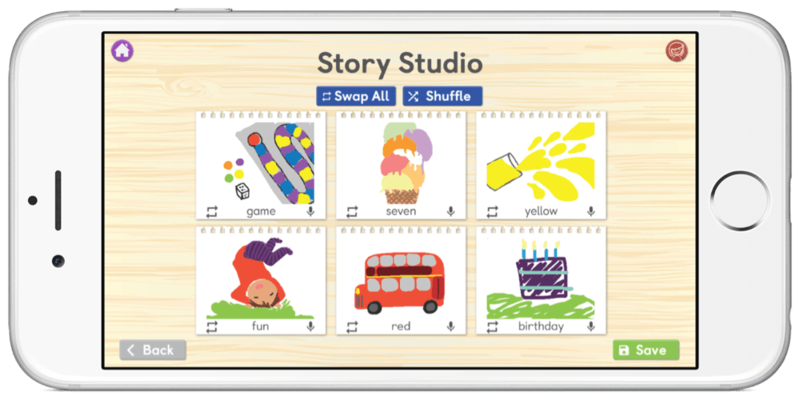 Children with learning disabilities or those that struggle being motivated with reading or sight words will definitely benefit from this app. They may need a little assistance getting started. Other individuals with Autism and ADHD may also benefit from this app. It is a lot of fun and welcomes creative thinking. Download HangArt in the App Store today!